Hung Yen (VNA) – Following the construction of Quoc Tu Giam Temple of Literature in Hanoi, which is seen as Vietnam’s first university, in 1070, many temples of literature were built across the nation. Xich Dang temple of literature in the northern province of Hung Yen is one of them. Xich Dang temple of literature in Hung Yen city is the second oldest, after Quoc Tu Giam Temple of Literature in Hanoi. The establishment of temples of literature reflected Vietnamese people’s fondness of learning. Xich Dang temple of literature was constructed in 1804. However, in 1839, the building was renovated with the current beautiful and large scale. After more than 200 years, its architecture remains intact. Covering 6,000 square metres, Xich Dang temple of literature consists of a three-door entrance gate and a crossroad where examinations were held to select talented scholars. An ancient bronze bell and a musical stone built in the 18th century are among precious artifacts that remain undamaged. The main area of Xich Dang Temple of Literature was built based on the imperial palace’s architecture of the Nguyen Dynasty (1802-1945). Visiting the temple, Nguyen Thi Hue said she prayed for successes in work and life. 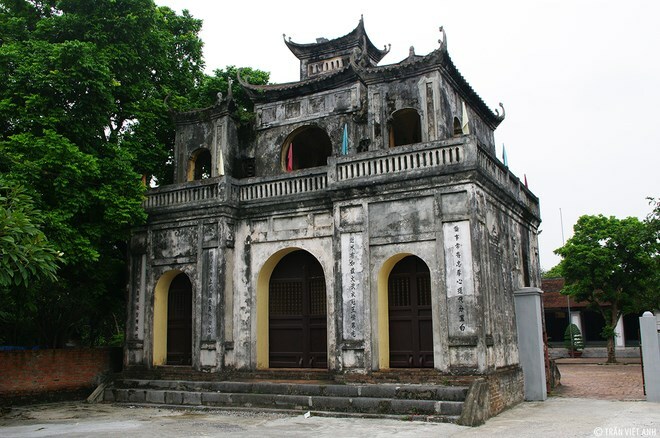 Xich Dang Temple of Literature is the place to worship Confucius – the founder of Confucianism. Moreover, the middle of the room is a place to worship Chu Van An, a talent and moral teacher of the Tran Dynasty that ruled from 1225 to 1440, and known as the “the ancestor of Confucianism in Vietnam”. There are nine stone steles preserved here. These steles were inscribed with the names of 161 talented scholars in the locality, manifesting the studious spirit of local people.